Each consultant has a different area of expertise allowing us to offer the best advice and treatment for any particular patient. This means that a patient with prostate problems is looked after by an expert in prostate treatment, and a patient with kidney cancer is managed by a kidney cancer specialist. We appreciate that urological problems can cause concern and anxiety for both our male and female patients and so we strive to ensure that the patient experience is as pleasant as possible. Our knowledgeable and professional staff will deal with your problems in an understanding and reassuring manner. Your care will be personalised for your particular needs and all treatment options explained in an understandable way. 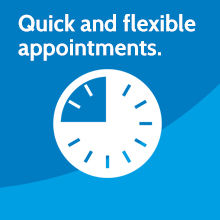 In order to minimise delay and unnecessary concern we offer a rapid assessment service for a number of conditions including lower urinary tract symptoms, haematuria (blood in the urine) and suspected prostate cancer, and suspected ureteric and kidney stones (renal colic). Our patients are assured of friendly, personalised and professional service.